It’s only fitting Chrysler would introduce the new 2015 Chrysler 300 sedan in Austin, Texas — a uniquely-styled sedan that defies it’s conservative full-size sedan segment, launched in a liberal city (…Keep Austin Weird) that completely defies the notoriously stauch state to which it belongs. Going against the grain can either pay dividends and garner a following or turn out to be completely ostracizing. Fortunately for the Chrysler 300, since it’s debut in 2005, this peculiarly designed sedan has resonated with people seeking something a little different in the form of a larger sedan. 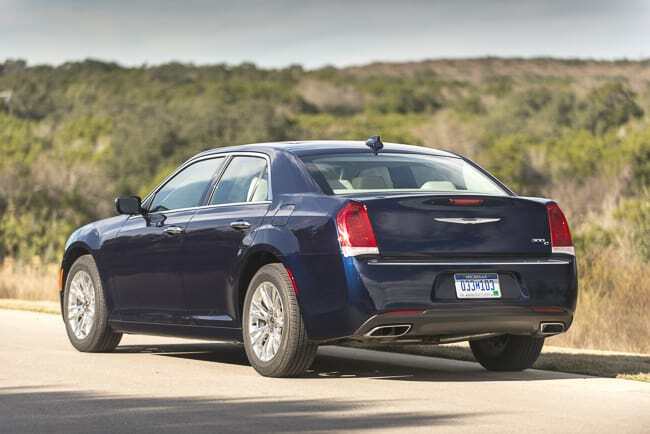 Ten years later and in it’s third-generation, the 2015 Chrysler 300 has established itself as a sophisticated, confident, all-American vehicle putting competitors on notice. Austin, TX – Available in four models, the 2015 Chrysler 300 starts at $37,395 for the 300 Touring with rear-wheel drive, topping at $45,295 for the 300C Platinum with all-wheel drive; the all-wheel drive is now offered across all the trims when paired with the standard 3.6L VVT V6 engine producing 292-hp at 6,350 rpm and 260 lb.ft of torque at 4,800 rpm. To step it up, the top three models are available with the 5.7L HEMI V8 putting down a whopping 363-hp at 5,200 rpm and 394 lb.ft of torque at 4,200 rpm, propelling from 0-100 km in under 6-seconds. New for 2015, and standard in every 300 model, is the TorqueFlite eight-speed automatic transmission blending performance with fuel efficiency, resulting in what Chrysler states is best-in-class fuel economy for both V6 highway and all-wheel drive ratings. What’s even better? The rear-wheel drive 5.7L HEMI V8 — with all it’s 363-hp glory — now offers a 6-percent boost in fuel economy over the outgoing 2014 powertrain. Not sure consumers equate HEMI with fuel efficiency, but hey, we won’t complain. In addition, the standard electric power steering also improves fuel ratings. The exterior styling of the new 300 retains that long stance and strong proportions we’re familiar with, dating back to 2005 when Chrysler first introduced this full-size sedan. Despite being an all-new model for 2015, the overall styling is fairly similar to the outgoing version, but now, the Chrysler 300 is much more refined. And while the main character lines are familiar, the new subtle styling cues do make an impact. The front grill is 30-percent bigger surrounded by fuller front surfaces resulting in a cleaner look, plus, the pillars along the side are now smaller while the windshield now sits higher. The rear-end design, which from a distance looks virtually unchanged, is now cleaner with a lift to the entire rear fascia along with a flat deck lid blending into the resculpted taillights now with LEDs. Gone are the round exhaust pipes replaced by more streamlined, elongated pipes adding that extra dose of sophistication, which frankly, look way better and more age-appropriate, if we can say that. With the S version of the 300 sedan, Chrysler is targeting a younger market, doing away with the shiney chrome exterior touches in lieu of modest, and arguably more stylish, blacked-out accents including black 20-inch wheels, headlamps, front grille, and optional black roof. The 300S also finds a minimal deck lid spoiler and colour-matched side mirrors. These visual changes are all fairly minor, but collectively, they render the sporty 300S into a much meaner and less belongs-to-my-dad sports sedan, which is exactly what Chrysler’s after with their anticipated volume-seller S model. Note: the 300S isn’t all-show and no-go; it gets a unique sport-tuned dual exhaust system while the upgraded 3.6L V6 which comes standard puts down 300-hp (boost from the standard 292-hp). Compared to the competition in terms of exterior styling, the Chrysler 300 stands alone — a sculpted iconic design, bigger wheels available in six new designs, huge flat surfaces — the 300 is arguably the best-designed sedan of the American bunch; add the 363-hp 5.7 HEMI V8 and there’s not much comparison. But with such a bold and distinct design, the Chrysler 300’s striking looks won’t appeal to everyone, especially in the more conservative full-size sedan segment where the likes of the new Chevrolet Impala or Ford Taurus may continue to win consumers over. Inside the 2015 300, and inline with essentially every automaker these days, Chrysler focused on two things: premium, hand-crafted interior appointments and more technology. The cabin is completely redesigned, offering the most passenger volume and rear seat leg room in its class. Driver front-and-centre is a new instrument cluster fusing both analog and digital design elements, including a huge 7-inch in-cluster display available as standard. Also standard is an 8.4-inch touchscreen display, the largest in the segment. While the large screen is welcomed, it’s flanked by two huge vents with an analog clock above which all looks a bit confusing and not-so refined. Below, the most significant change to the centre stack is the addition of a new electronic rotary transmission shifter, also found in the new, smaller Chrysler 200. This flat, dial-style shifter adds luxury while opening up the centre console space. The steering wheel is also redesigned with a new three-spoke look including larger controls and available die-cast paddle shifters. For a little something extra, add optional illuminated dual heated/cooled cup holders. Also worth noting, rear passengers receive dual USB ports — a fairly basic feature surprisingly missing in majority of vehicles these days, from sedans to SUVs. You’ll like this car if … You need a full-size sedan without the conservative full-size sedan stigma. Interior: High-level craftsmanship and materials but ambiguous, curvy design layout. Performance: Super smooth on the highway with capable power via 3.6L V6 plus the new AWD system feels superb. There’s a reason the Chrysler 300 has been a huge success since it’s inception in 2005, and for 2015, the tradition continues retaining almost the same design but now with a greater dose of refinement, quality, and technology.